I’m really thrilled to open up the doors today for Fly School with Anni –online course! Just think about yourself ready and confident to head out fishing. How awesome it will be to stand in your waders knee deep in the water holding that fly rod and feel the dream fish of yours fighting at the end of your line! The best part about this online course is that you don’t have to spend hours reading those mega-detailed books and getting overwhelmed with all the small details and techniques. I’ve designed the course in same way how I learned fly fishing. And that is, as fun and fast as possible. So you can get to the good part and start fishing. In Fly School with Anni we focus to get you the needed basics and you will build your own fly fishing path with the help of the course and support from me and other likeminded Fly Schoolers. After spending 6 weeks on Fly School with Anni you have covered everything you need to get started. Each week you know exactly what to focus on so you don’t get overwhelmed with all the possible things related to this fine art. So this is really efficient and fast way to learn. After the course you are ready to head out on your first (or next) fishing trip. And ready to chase that ULTIMATE DREAM CATCH of yours. The whole point is, that you are ready and confident to start fishing, enjoying and living those new experiences. NOW! Life just goes too fast for us not to grab those dreams of ours right now. And start living right now. If you want to bring something new and awesome to your life this year, I suggest you take up this chance. And see just how much awesomeness fly fishing can bring to you. 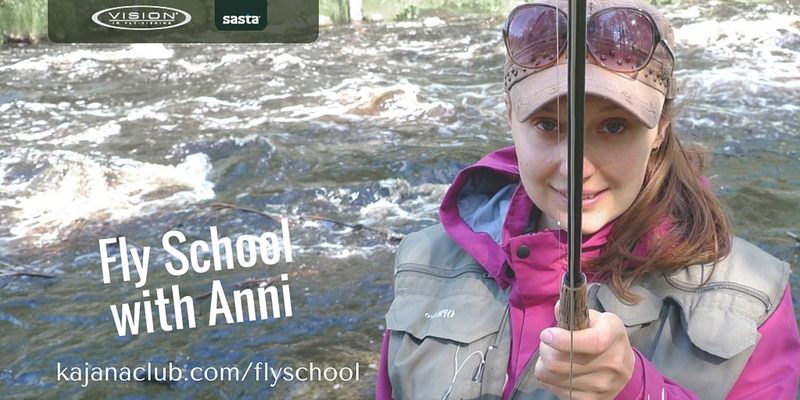 I’m really happy how the Fly School with Anni turned out, and I know that if you want to learn and get better at fly fishing you will love this course. I’m especially proud how the course gets you to build your own fly fishing path based on YOUR fishing waters and what YOU are interested in. As well as how you will learn fly casting on this online course! (I think that the system is pretty clever). And also I’m really happy for the support of our awesome sponsors Vision in Fly Fishing and Sasta Clothing.